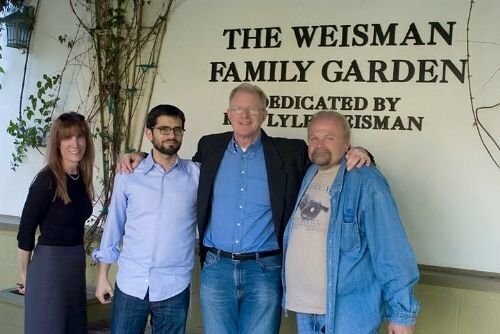 Actor Visists Chabad Drug Center Six-time Oscar nominee Ed Begley Jr. visited with the residents at the Chabad Residential Treatment Center Monday in in Los Angeles, CA. The actor and environmentalist chatted with the residents, discussing his battle with addiction and subsequent 30 year sobriety. “I have the highest respect for Chabad and what they are doing at CRTC,” said Begley after his visit. "I’ve known about the center, but this was my first visit and I’m so pleased I was able to spend some time and meet the guys," he added. Since 1972, thousands of men from many and varied backgrounds have been successfully treated at Chabad’s Rehabilitation Center, according to criteria established by the national institute on drug abuse in Washington DC. Graduates of the long-term program achieve success far above the national recovery rate. “When you see a guy [Begley] who was so down and out and was able to turn his life around and become so successful, that’s an incredible source of motivation” said 29 year old resident Scott B. “The goal at CRTC is to give each client the foundation and motivation to lead an alcohol and drug free lifestyle with confidence and as a productive member of society” said Chaim Marcus, who liaisons between the center and the Hollywood community. “If there was an Oscar for being a super mentch, Ed would win it every year,” said Marcus. Chabad views drug abuse as a symptom of a deeper problem and uses a psychological-therapy and 12 step model that concentrates on the underlying issues contributing to dependence. “We focus on establishing a structure that promotes recovery and improves the quality of life, placing special significance on ethical and moral growth that is so vital to the development of personal integrity,” said Donna Miller, executive director of the center.